Sure, your dress is usually your biggest concern on a day like your wedding. However, trying new and very on trend make-up tricks on this day may not be the best of ideas. Remember, not only will people be drooling over your stunning wedding gown, but the photographer will be snapping away, capturing your every expression. 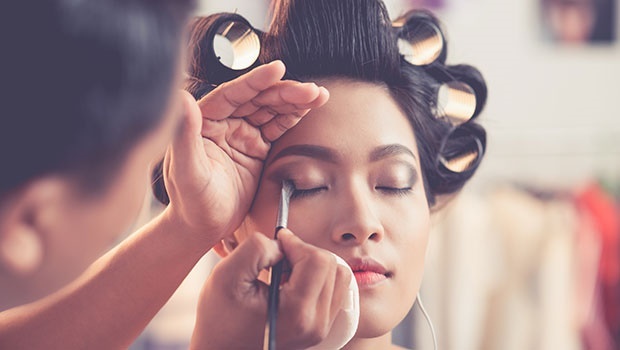 Try not to go for the hottest, trendiest make-up looks you just spotted in your favourite fashion magazine. You want to feel and look like yourself on your wedding day – no need to add more stress to an already very stressful day. Avoid smouldering red lips. Your colour-scheme might be white and red, but red lips photograph really badly – especially when some of the pics are printed in black and white afterwards. Also, red lips and white wedding couture don’t mix. Hello?! This is a day known for its magnificent waterworks. No matter how strong you are, you will cry when your partner tells your friends and family about that one thing that distinguished you above all other women. Trust me. Waterproof up. Trying these for the very first time is not the best idea. What if it starts to come loose half way through the ceremony? Or even worse, you might be allergic to the glue and get a reaction! Rather invest in a lush mascara like Le Volume by Chanel. Resembling an orange on your big day can be rather upsetting to both you and your 150 guests. If you don’t like that pasty-white look, go for a professional Caribbean Tan spray-on a few months before your wedding as a trial to make sure the results are desirable. What kind of makeup look did you go for on your wedding day? Send us your pics!